We are so proud to announce that Houzz has selected Rose Architects as winner of their Best of Houzz 2019 – Client Satisfaction award!! This award is granted tothe top 1% of providers in their local markets. In other words, we are kind of a big deal! Thanks to our clients from 2018 for helping us to earn this award, it is sincerely appreciated. Think you don’t have the time to tackle a home improvement project? Good news: There are a number of easy renovations you can do in one day — without the help or cost of a Contractor or Architect. Here are four that you can do with just a few basic tools. Over time the seal around a bathtub or shower can wear, discolor and crack, allowing moisture to pool inside and creating a perfect environment for mold and mildew to grow. But ­recaulking is much easier than most people think. To begin, use a caulk remover to soften the existing caulk; this will prep the surface and make it easier for you to remove the caulk using a utility knife with a fresh blade. Once all of the old caulk has been removed, use a damp cotton rag to clean away dust. Let the surface completely air-dry. The caulk line you’ll create is called a bead. To create an even bead, lay parallel strips of painter’s tape above and below the entire length of the tub seam. Then, load the caulk into a caulk gun, point the nozzle at a ­45-degree angle, and apply steady pressure to the trigger as you move along the seam. Don’t skip the tape step! This caulk will stay in place for a long time and you will see it everyday, so take the extra few minutes for this step. Finally, slide a finger along the joint to smooth the bead, remove the tape while the caulk is still wet, and let the caulk cure for at least 24 hours before using the shower or bath. If your shower head has low water pressure, it might just need a deep cleaning to get it unclogged. But if you’re ready to upgrade to a rainfall shower, or a shower head with relaxing massage jets, you can replace the old head in less than 20 minutes. First, make sure the water is turned off. Then, use an adjustable wrench to loosen and unscrew the old shower head. Once the head is off, remove any old plumber’s tape and scrub the threaded connection between the showerhead and the joints, using a toothbrush dipped in vinegar, to clean away rust or mineral deposits. Leaving these deposits in place can make connecting the new head a challenge. It can also cause leaks. Wrap plumber’s tape in a clockwise direction two or three times around the threads of the shower arm. Use your finger to smooth out the tape. Next, place the new shower head onto the shower arm and twist it clockwise by hand to secure it. Turn on the water. If leaks occur, carefully tighten with an adjustable wrench — making one-quarter turns at a time — until there are no leaks. Want to add drama to a room? Try hanging bold wallpaper to create an accent wall. Even though there are a fair number of steps involved, this project is still doable in one day. Use pre-pasted wallpaper so you don’t have to buy paste and a special applicator brush to get the wallpaper to stick. Start by sanding the walls and cleaning away any dust or debris so no lumps show through the paper later on. Then, using a level in the vertical position, draw a straight vertical line on the wall in pencil; this is called a “plumb line.” Roll the paper out on the floor and use scissors to cut the initial paper to fit the height of the wall, plus an extra four inches. Before cutting your next piece, align it with your first piece to make sure the pattern will match. You may need to trim a few inches so the pattern lines up perfectly. Then, measure and cut each consecutive strip, repeating the same technique to match the pattern. Roll up the wallpaper so the pattern is visible and soak it in a wallpaper tray filled with lukewarm water for three to five minutes. (Check instructions per manufacturer, as times may vary.) To wet evenly, carefully slide the roll from side to side in the tray so that water flows between the layers. Slowly remove the paper strip from the water bath, and as you unroll it, gently fold the paper so the top edge and bottom meet in the middle of the strip with the sticky sides touching each other. Do not crease it and make sure the pasted sides line up evenly so the paper does not dry out along the edges; this lets the glue set. Let the paper sit in the wallpaper tray for another two to three minutes, or as directed by the manufacturer. Before putting the paper on the wall, remove any outlet and switch covers. (Cut the power beforehand.) Then, gently unroll the paper strips onto the wall, working your way from top to bottom, and keeping the edge of the paper aligned with the plumb line. Match the pattern as closely as possible. As the wallpaper sets, you can use a 12-inch paint guide to remove any bubbles and carefully cut around any electrical outlets. Finally, hold the paint guide along the top edge, where the ceiling meets the wall, and cut excess paper off with a utility knife. Repeat at the bottom of the wall, along the top edge of the baseboard. Place the outlet and switch covers back on. Want to freshen up the look of your flower or vegetable garden? You don’t need a green thumb to edge your garden — a simple process that entails forming borders to separate your lawn from your plantings. These borders, or “edges,” will give your garden a crisp, clean look. First, mark the boundaries of the bed using string. Then, take a flat-edged shovel and slice into the turf repeatedly, along the string, until you’ve outlined the entire bed. Don’t rush; just gently pull back on the shovel to loosen the earth. Remove the loosened dirt with your hands and lay down two to three inches of fresh mulch along the edge of the boundaries before removing the string. You can periodically use a pair of edging shears to maintain the clean borders you’ve created — keeping your lawn and mulch in their proper place. Do you have a larger project in mind that requires a Home Improvement Architect? Contact Rose Architects today to learn about our cost effective solutions to your home improvement needs. From interior renovations to complete additions, we can help you with any aspect of your home improvement project. Is an Architect Necessary For Remodeling and Renovation Projects? Investing in a Renovation Architect at the onset of your project will save you time and money as the work progresses. An Architect can be the key to a beautiful and functional remodel project. But the cold hard truth is that design pros can add unforeseen expenses to your job. For what situations does it make sense to hire a Renovation Architect? Here are the three most common reasons to hire an Architect when starting a remodeling project. Sometimes the building department requires that you have an Architect or Engineer sign off on all drawings submitted for permit. If it is a requirement where you live, then you will literally have no choice. It is in your best interest to hire an Architect asap to avoid extra costs. The sooner an Architect is on your team, the sooner she or he can start making informed design decisions. The goal is ALWAYS to make construction go as smoothly as possible. In addition, the reason the building departments have this requirement is for the protection of consumers. Contractors are irreplaceable and amazing at what they do. One of their main jobs is to get your project built as quickly and safely as possible. They know how a building comes together although sometimes the aesthetic outcome is not as important as the fact that the project has been completed. By hiring a Renovation Architect, you are bringing in a true third party that brings a keen design eye to your project. What many consumers are not aware of is that Architects are actually trained in all facets of design. This includes some light engineering and interior design as well. Legally, an Architect can sign off on the design of most engineering systems and all interior design. The inverse is not true though. Interior designers and engineers cannot sign off on all Architecture plans. In some instances you may have a structural engineer sign a complete drawing set. More recently the building departments have been pushing for only Architectural Drawings to be signed and sealed only by an Architect. What does a Renovation Architect actually do? So now that you understand the three top reasons for hiring a Renovation Architect for your remodeling/renovation project, what exactly does an Architect do?! Architects are jacks of oh-so-many trades. We are trained in buildings’ design, engineering, and functionality. At the kickoff of your renovation project, your Architect will listen to your exact project scope, organize all project goals, and coordinate the required drawings from start to finish. Often times they even act like the project manager, organizing and coordinating any required outside consultants. Some examples are: geotechnical engineer, color designer, kitchen designers, etc. Depending on the type of arrangement you have with your Architect, they can prepare something as simple as a general floor plan layout to be used for HOA approval. They can also make a complete, comprehensive set of construction documents that have all details necessary to create a beautiful project. Alternatively, their scope of services can end up somewhere in the middle. An example is the creation of a Permitting Drawing Set. This is comparable to Construction Documents minus all of the extra detail drawings. What is the cost range for a licensed Florida Renovation Architect? Ready to hire an Architect, or at least chat with one? We thought you’d never ask! Please call us today at 954-873-9007 or if you’d prefer feel free to contact Rose Architects via our webform. 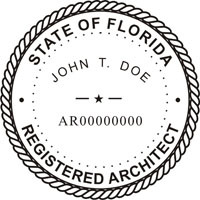 Click here to verify our business license on the Florida DBPR website. The process of hiring an architect can be a daunting task. What comes first? When can changes be made? How long will it take? When will the design be simply a concept versus a final document that is ready to be built? We hear these questions on a daily basis and have prepared this document as a roadmap to our architectural process. There are 7 steps in our process and each is dependent on successful completion of the prior step. The interview is a great opportunity for the Client to make sure there is a fit with the Architect they are considering hiring. This step is skipped if the Client has already decided to hire the Architect based on a great referral or if they have worked together in the past. We consider each project we embark on to be a partnership and the interview is typically the first step in all healthy and mutually beneficial relationships. For smaller or fast-tracked projects, interviews can also take place in the form of phone calls or emails to familiarize the Architect with the clients and their project. If both parties decide that it looks like there is a good fit, a contract is executed for the project and preliminary work begins. In this step, the Architect and Client review all of the requirements for the project.The Architect relies on city-provided historical plans for creating an interior survey (or as-built as referred to here), but if none are available they will visit the site and create “as-built” drawings of any existing conditions that exist. The latter sometimes requires an additional fee, so if the client has any documents on the home layout this is always preferred. Typical as-builts are very basic (but accurate) representations of any built conditions currently present. A surveyor will also need to be contacted by the Owner at this stage to create site drawings, which are an exact representation of the project site. This is very important and absolutely necessary not only for permitting reasons (see Step 4), but also to make sure the project gets built correctly after being designed. Combining the survey and as-builts into a single site plan drawing results in the starting point of all schematic design and feasibility studies. Depending on the project timeline and complexity, the Architect will generate one or more ideas for the project’s preliminary conceptual design. Elements like the flow of the space, organization of the space functions, and how the project is experienced are addressed diagrammatically. There is no “real” architecture at this stage per say, although the Architect will start to consider materiality, structural, and mechanical systems when appropriate. The Client should expect diagrams and sketches at this point, and possibly very general floor plans, elevations, or sections for the purpose of explaining the concepts behind the project. Once all concepts are agreed upon after a few opportunities to review PDF drawings, a meeting with the Architect and Client will be scheduled to sign off on the final design. These approved ideas will then be further developed into a much more realistic set in preparation for permitting and ultimately construction drawings in steps 4 and 5. The design continues to be developed (as the name implies) and what were concepts now turn into architectural decisions. If the material selections are included as an included additional service, they are now selected and the major systems of the project (mechanical, electric, plumbing, structure) are created by various consultants and added to the drawing set by the Architect. This is also the time to address important areas like code compliance, architectural details, fixture selection, and window/mullion configurations. The drawings and renderings that are developed are ready for obtaining permits, to be used as marketing collateral, or in the case of a developer used for fundraising purposes. Not every job requires full Construction Documents (CDs), and many home renovation drawing packages are considered “complete” at Step 4. CDs drawings are highly detailed representations that explain how every element of the job is to be constructed. Most Architects will submit permit drawings early in the development of the CDs so that no time is lost waiting for the building department to provide feedback and ultimately approvals for the project. The finalized CDs will have each and every specification needed to build the project, down to the color of the trim and the size of every window mullion. Once the Architect has all CDs finalized, the Project is ready to go to bid. The next two steps are often managed directly by the Client (or their GC at step 7) and Rose Architects offers them as Additional Services. The Permitting or Construction Drawings are sent to multiple contractors and the resulting bids will be reviewed by the Architect and Client. The best fit can be decided based on cost, timeline, experience, or best value – it all depends on a number of factors when making such an important decision and the Client will always have the final say. The Architect will remain involved with the project all the way through construction completion (with the exception of minor work or other unique situations). The Architect’s role at this point in the project is to make sure the project is built in accordance with the Construction Documents, especially as it relates to the design intent and the Client’s best interests. Periodic meetings with the Contractor will take place to monitor job progress, and if necessary, Change Orders will be created and submitted to the Client for approval to adjust for any issues that occur in the field. The Architect will also review all invoices and scheduling to ensure the project stays on track. In addition to the steps outlined above, there are numerous milestones that will need to be signed off on by both the Client and the Architect in order to proceed with the project. We do this to ensure that everyone is on the same page and that there are no surprises. Surprises in architecture result in increased costs and delays…the two things we always do our best to avoid! Contact us today to get started on your project. We can’t wait to partner with you and help make your vision a built reality!